It’s been a while since I’ve been back to Black Olive Cerveceria, a Italian-Mediterranean restaurant in Capitol Commons. The opening of Estancia Mall has drawn most of the attention from Black Olive and it’s neighbors, the first ones to open in Capitol Commons, almost 2 years ago. 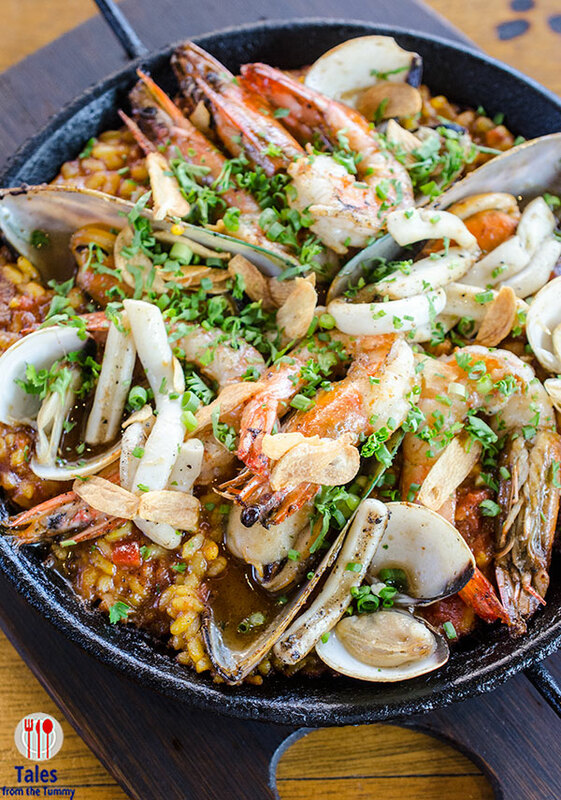 Chef Carlo Miguel has added more items to their menu ranging from Italian bar chows to paella and improving their old dishes. 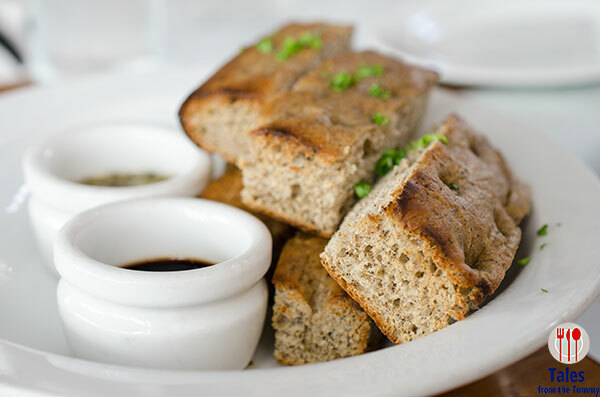 Every meal in Black Olive comes with their store baked foccacia bread. It’s a bit different because they use hand spent grain and beer dough from Brewery’s beer brewing process which the bread chewier and have more character. The Tomato Caprese Salad (P480) is a re-imagination of the classic caprese. 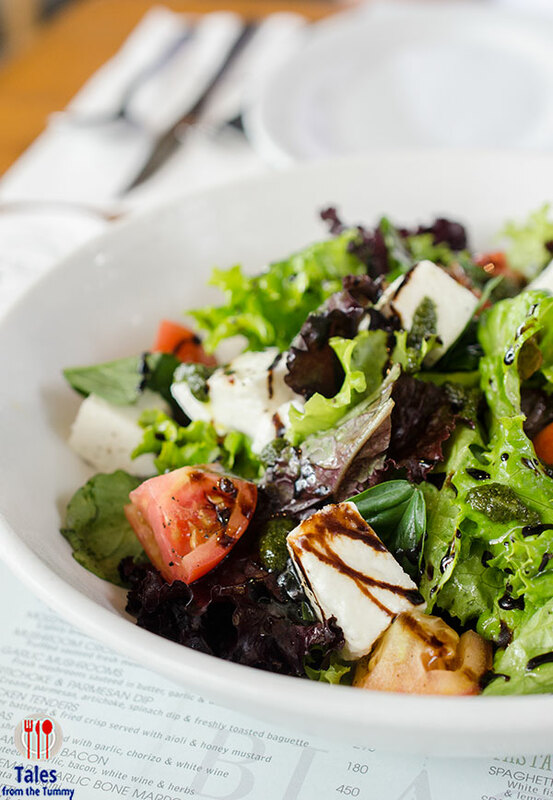 Instead of slices of buffalo mozzarella and tomatoes, they makes cubes and toss it with mixed greens and balsamico. Simple and fresh starter. 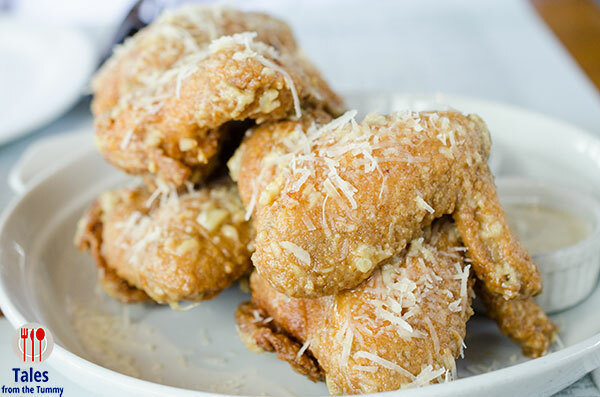 Chef Carlo Miguel created some Italian leaning chicken wings because who does not like chicken wings with their alcoholic beverages as the perfect bar chow. You might go for the more familair flavors of the Garlic Parmesan wings (P480) but I highly recommend the Balsamic Chicken Wings (P480). 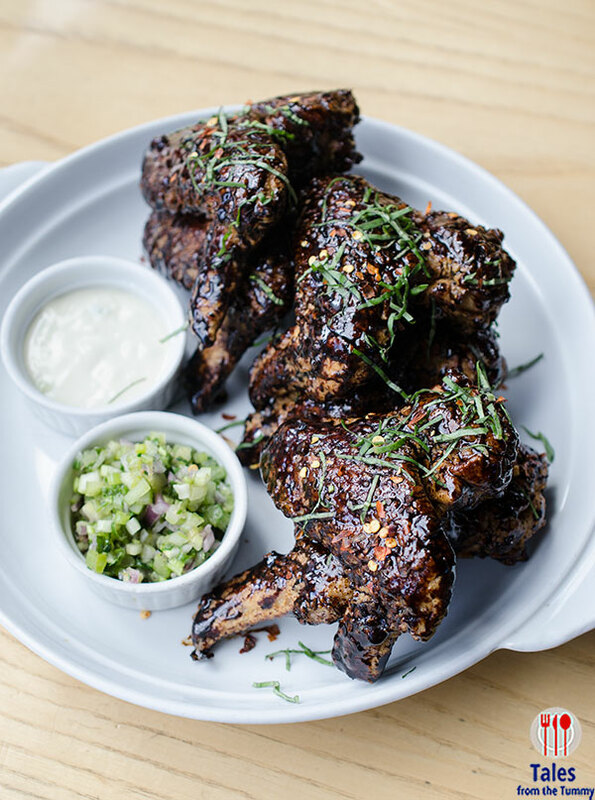 1 lb of chicken wings are tossed in chili, garlic, basil and balsamic reduction for a crunchy sweet and spicy flavor. I was able to try two of their pizza offering and both did not use a tomato sauce base. All pizzas at Black Olive uses the same spent grain and beer dough they use in their foccacia bread for a different chewiness and crunch. 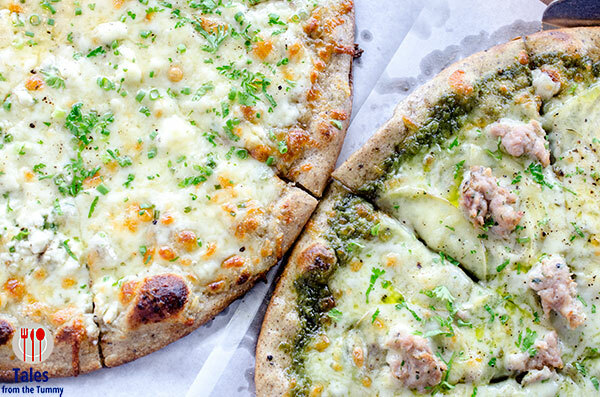 The White Cheese (P480) has mozzarella, parmesan, feta and roasted garlic. I preferred the stronger flavors of the Italian Sausage (P550) and an unusual sliced potato, mozzarella and parmesan base in addition to the generous amount of crushed sausage. The Stracci Pasta (P280/solo, P550/sharing) will not win any awards for its looks but it sure delivers spades in taste. 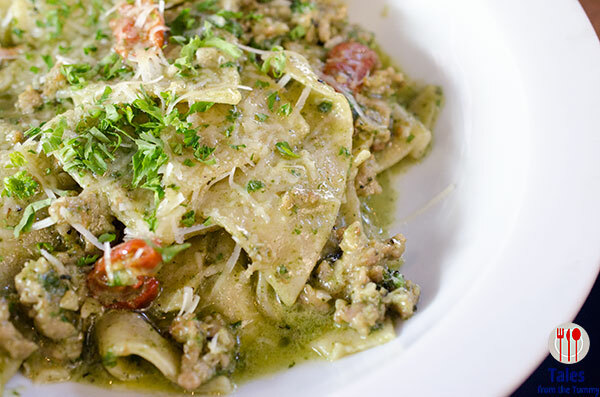 The delicious Italian sausage is at the middle of this fresh pasta dish that loosely translates as rags in English. Roasted tomatoes, pesto cream and parmesan are tossed in to complete this dish. I was surprised to see the Black Olive Paella (P690) on the menu. Using a sofrito as a base for cooking the rice makes it the paella very tasty. It’s topped with lots of seafood and finished of with toasted garlic slices. If you like the dry and toasted paella then this one is not for you but it was perfect for our more saucy paella tastes. For heftier appetites, the Black Olive Rib-eye (P1,550) will hit the spot. 12 oz. 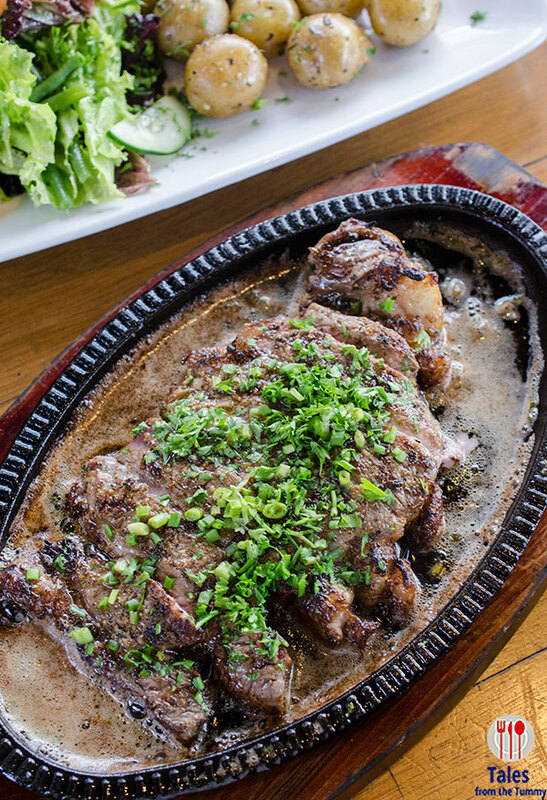 Angus rib-eye, cooked with just mustard butter and served on a sizzling plate. The aroma alone will have you salivating even before a single bite. Served with rosemary garlic potatoes and side salad. For dessert, you can go for the usual Tiramisu (P275) or go for the unusual Marsala and Walnut Semifreddo (P250) but you can’t go wrong with either. 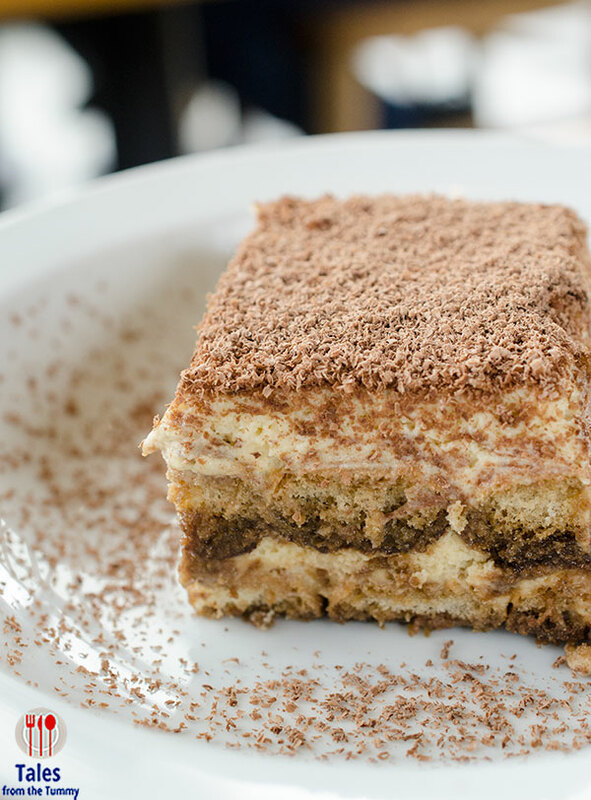 No scrimping on the tiramisu as you can taste the strong coffee flavor and the rich flavors of the liqueur. 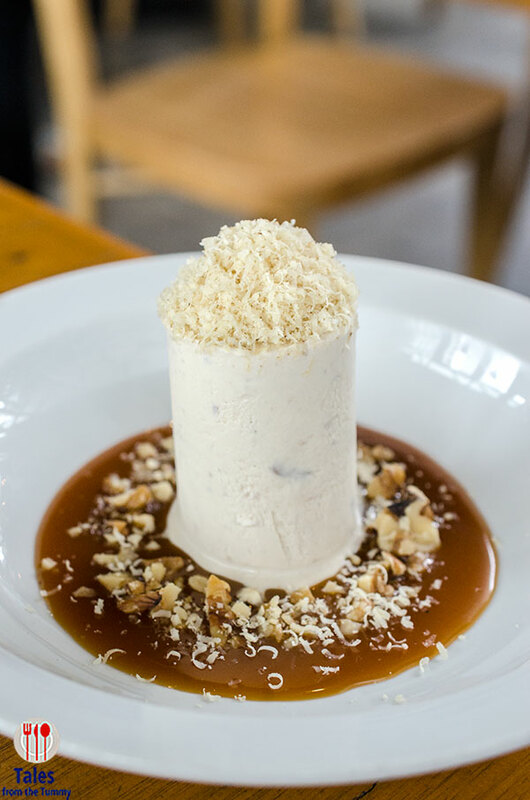 The semifreddo is a semi frozen dessert with a cream base but this one adds, masala wine, walnuts and adds caramel sauce and walnut shavings. 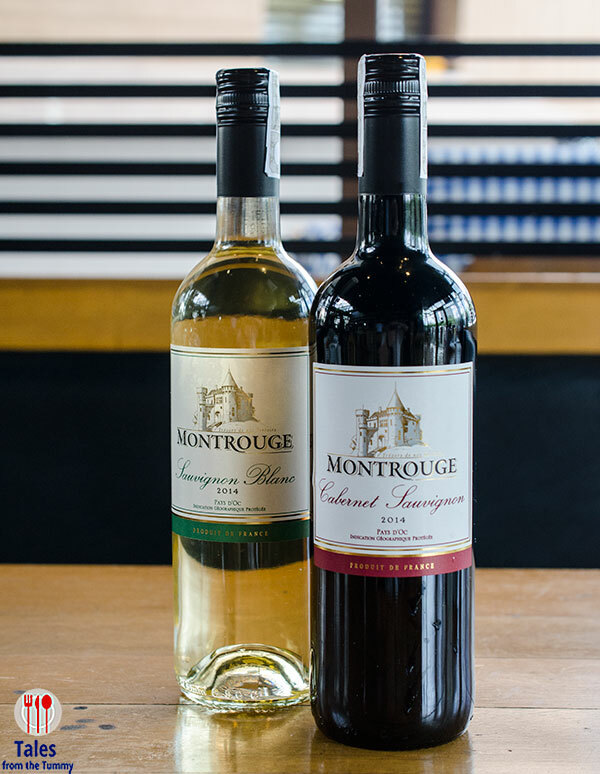 To celebrate Valentine’s Day, Black Olive will be offering Buy 1 Get 1 (BOGO) on Montrouge Cabernet Sauvignon and Montrouge Sauvignon Blanc. The promo will run from Feb. 12-14, 2016 only, this is even better than their Christmas promo of 20% off. If you think about Black Olive, your mind might gravitate towards a good time with lots of drinks but they serve real good food with some dishes that are pretty unique. It’s a great place for a nice, bright, quiet lunch as well as a place to while the night away. Meralco Ave. cor. Shaw Blvd.